About two weeks ago I returned back to England following my two-week trip to the subtopical Açores archipelago. I stayed on the largest of the nine islands, São Miguel, which is only 62km in length and 16km wide. The islands are part of Portugal but they are roughly 1, 360km (850 miles) off its coast in the middle of the Atlantic. What made me decide to go there? Last year I did something similar, WWOOFing around the mainland of Portugal, and I found that it was a fantastic way to leave your comfort zone, see the world, learn a new language, meet new people and learn life skills. Learning Portuguese has been one of my aspirations for the past few years so it made sense to go back to Portugal. When I was researching where to stay, I saw ‘Açores’ on the list and after looking at a few photos of the islands and the cost of airfare I had made my mind up. The plan was to stay with a WWOOF host on the island for two weeks, a Portuguese and Dutch couple, their 3-year-old son, two dogs (one being an Estrela mountain dog!) and cat. WWOOFing is an exchange: I would get up early, walk the dogs and work on the garden or around the house until lunch time and in return I would have the afternoon completely to myself before helping out with dinner in the evening. In the afternoons I took the time to go and explore the island, which is what this post is all about. 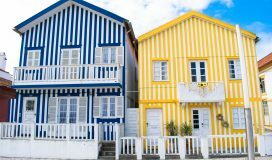 I flew into the largest city on the island, Ponta Delgada, and rather than going straight to my host’s house I decided to spend the day exploring the city and then stay overnight at the local hostel. Why not? The first thing that I noticed about São Miguel was how incredibly humid it was. It wasn’t hot, it was just sickeningly sticky! On that first day I had about three showers and wondered how I was going to survive over the next two weeks. Fortunately, it turned out that it was so humid because of a hurricane in the Atlantic and after an epic thunderstorm the humidity then dropped down to comfortable levels. I couldn’t find out the name of this tree, but it reminded me of the tree from the first Jurassic Park film where the 4×4 gets pushed off the edge by the T-rex. The plants on the left hand side are aloe vera plants, though I didn’t realise it until afterwards. In my first week working in my host family’s garden I got some wicked sunburn on my forearms and Raquel, my host, gave me a branch from an aloe vera tree in her garden. When you cut the leaves the goo is exactly like what you see in the bottles that you can buy in the shops. I was really surprised, you just rub it on your skin and it soothes it. It grows everywhere in the Açores and once you know what it is then you notice it everywhere! I should’ve held up my arm for reference here, but the bamboo you can see is probably as thick as my fist. I took this photo for my folks because we have an ever-growing bamboo bush, but it certainly isn’t as crazy as this! On my second day, I got the 9:30am bus to the north side of the island with a guy called Daniel (hi!) that I met at the hostel in Ponta Delgada. He wanted to see the famous two lakes – Lagoa Verde and Lagoa Azul (the green and blue lakes), which are very close to where my host lives. So we caught a bus together with a view of spending the day at the lakes and at the end of the day we would part ways, he’d head back to the hostel and I’d seek out my host’s house. This photo quickly became the wallpaper shot on my iPhone. What a snap! We were walking along a dusty volcanic track and suddenly stumbled across some incredible views of the northern coast. For the first time since I arrived I actually felt like I was on a tropical island in the middle of absolutely nowhere. What a feeling. Several days after this I came back to this spot and found a nice quiet patch on a cliff close by, and for about an hour or two I just sat and read a book and felt like I was a tiny speck in the universe. Here you can see the town of Mosteiros in the background, which is where the sunset shots later in this article are taken. A lot of people go there because they have many beaches and rock pools. There is one thing that I learnt very quickly about the São Miguel island: they have an abundance of ginger lilies and hydrangeas. Hydrangeas actually grow *wild* here and, despite being very pretty, are another invasive species. One thing that is worth knowing is that the Açores are often battered by harsh winds so the farmers will grow hedges to divide the fields into very small fields to reduce the impact of the wind. These hedge rows will very likely be formed of hydrangeas and look absolutely stunning! One afternoon we made a trip to the beach at Mosteiros and had a picnic on the black volcanic sand. I’m not really the kind of person who goes to beaches but I felt like a big kid making sand castles and running around in the sand with my host’s 3-year-old kid. If you look closely you can see the natural pools that have formed in the rocks. There is even a ladder so you can lower yourself in. On this particular afternoon the tide was already quite high so we opted out and went to the beach instead. I collected some amazing rocks on the beach at Mosteiros that were made of pure carbon. I’m still finding volcanic rock particles on my clothes! As I mentioned above, after I finish my morning work I get the afternoon all to myself and I tended to go for a walk. On one afternoon I decided to climb a hill near the house, called Pico de Mafra, and Raquel’s little dog came with me. Above is the view of Mosteiros (the town!) from Pico de Mafra and the photo below is my attempt at taking an arty photo with Pico de Mafra in the background. To the left is the village where I stayed and to the right is the open ocean. And that’s your lot for now! 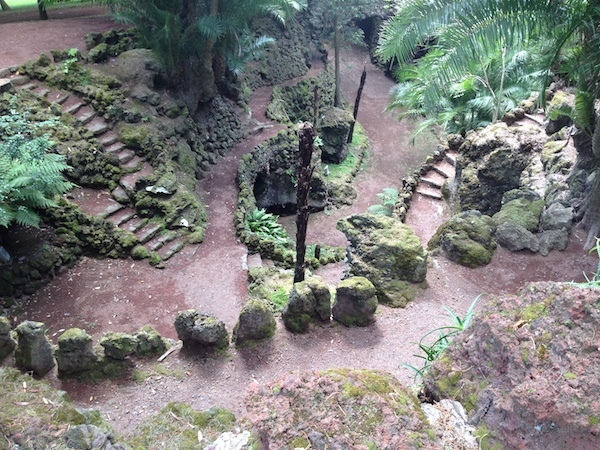 These photos are all from my first amazing week in the Açores. To read about the second part of my trip, click here!